The Farrelly Brothers have been working on a modernization of the Stooges, 'slapstick with heart' concept since the mid-90s. But it was their decision to focus on an origin story for Larry, Moe and Curly and thus introduce the three to a new generation that pushed the picture onto the fast track. Audiences have embraced The Three Stooges in a variety of mediums; vaudeville, shorts, television and home video but for Peter Farrelly the communal nature of a theatrical feature remains the perfect experience. 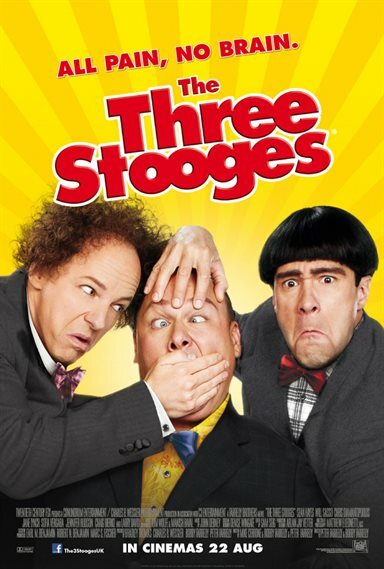 Download The Three Stooges in Digital HD from the iTunes store. The Three Stooges images are © 20th Century Fox. All Rights Reserved. Woo Woo Woo, Nyuck, Nyuck, Nyuck and all the sight gags you can handle are back and more impious than ever in The Three Stooges. The very cool film had me in stitches with inane comedy that hits the top of my laughter barometer. Although mainly a guy film, most all who can remember the knuckleheaded trio will love the insane comical antics that never seem to get old. In this episode we find Larry (Sean Hayes), Curly (Will Sasso) and Moe (Chris Diamantopoulos) being dropped off at a religious orphanage. As youngsters, the cutesy little cutups keep the Nuns hopping with their bungling making themselves un-adoptable. Fast forward 25 years and we find the trio still at the orphanage trying to find parents. One day they get a visit from Monsignor Ratliffe (Brian Doyle-Murray) informing the Nuns that they are in need of over $800 thousand to save the orphanage from going under. When the boys find out they set out on their own to get the money and save the home for the children. The story doesn't mean much here, as it's as silly as, well, The Three Stooges. After all what's a Stooge film without the crazy antics, wild clowning, bungled jobs, silly clothes, and ridiculous ideas? Well you know what I mean, all the things that have made the stooges fun to watch over the years. Well how did the look-alikes do in the roles of Larry, Curly and Moe? Amazingly good! They not only look like the three dummies, they walked talked and act like them as well. After the first 15 minutes my imagination got the best of me and the Howard's were back, alive and well. Each of the actors has to be commended on perfect performances and true to three of the best comedians ever. The only remnants of the ‘real' Three Stooges are somewhere in the archives of cable television slowly spooling out the remains of what happened to be some of the best comedy ever. It's hard to be in the shoes of partner greats like the Stooges, Abbot and Costello, Laurel and Hardy, The Marx Brothers and Martin and Lewis. The timing, punch lines, choreography, facial expressions, body movements and all the other elements that go into goofball antics have to be perfect in order to entertain their unquenchable audiences that demand they provide laugher. I have to admit; the Farrelly Brothers pull it off with pinpoint accuracy, amazing mimics and dumbest storyline that keep the laughter coming from the hilarious beginning to the heartfelt ending. The film has been rated PG by the MPAA for slapstick action violence, some rude and suggestive humor including language. Except from some scanty clad gorgeous women, some rude comments, and a purely tongue-in-cheek poking at religion, there shouldn't be much that's objectionable in The Three Stooges that you've not already seen in their films in the past.